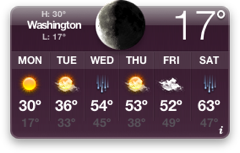 Yeah, it’s not warm out there. With wind chill around -5°F this morning, winter has broken down the gates and established its cruel authority over the DC area. As Jenn pointed out below, though, the days are getting longer here in DC, and the march toward 70 and sunny at the Tidal Basin has begun. I know that’s not much comfort when the mercury’s well below the water-freezing point, but just think, today’s sunlight duration was 2 seconds longer than yesterday. And tomorrow’s will be 6 seconds longer than today’s. Bundle up, this is something to endure.